This month the Irish Peatland Conservation Council launches its annual Hop To It Frog survey asking members of the public to send their frog sightings to the Bog of Allen Nature Centre. The Common Frog (Loscann Coiteann) Ireland’s only species of frog is an amphibian meaning it can survive both in water and on land. In Spring the frog begins to emerge from hibernation and adult frogs will start to gather at breeding sites. The male will attract females through a chorus of load croaking. The female frog will lay over 2000 eggs that are fertilised before their protective coat absorbs water and floats to the surface. These eggs are known as frogspawn and will develop for 10-21 days before the tadpole digests its protective coat and hatches. After 5 weeks of feeding on algae the tadpoles develop their hind legs, by 10 weeks the forelegs are growing and by 14 weeks young froglets begin to leave the water. After three years the young frog will have reached maturity. 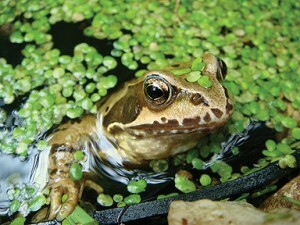 Frogs are known as the gardener’s friend as they will feed on many pests in the garden including slugs. The adult frog has eyes located on top of their head helping to watch for predators and food. On land frogs breath through nostrils however while in water they will breath through their smooth moist skin. They have good hearing and their large muscular back legs help them leap on land and swim in water. Frogs can change their colour depending on their environment this camouflage technique helps to protect them from predators. Their colour can range from pale green to dark green. The female frog is slightly larger than the male however the main distinguishing feature between male and female frogs is the male will have an oval swelling on the surface of their feet close to the innermost finger. Male frogs use this to hold the female during mating. This entry was posted in Wildlife Watch at the Bog of Allen Nature Centre and tagged Bog of Allen Nature Centre, Bogs, Conservation, Frogs, Places to Go. Bookmark the permalink.